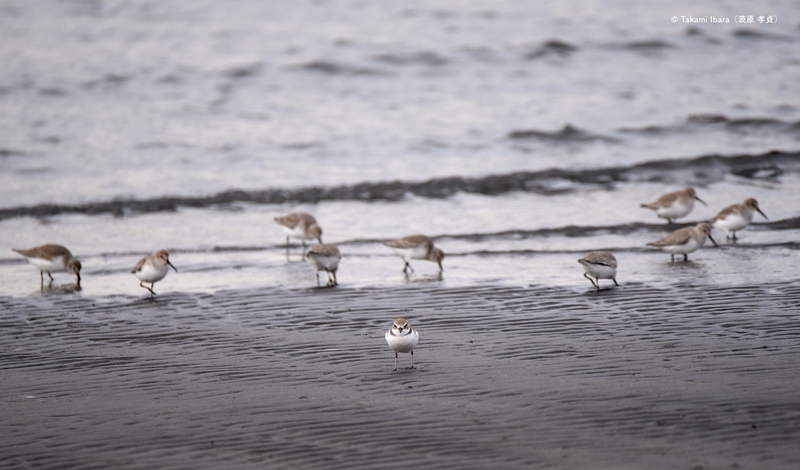 This entry was posted in Birds (鳥), Photography (写真) and tagged シロチドリ, ハマシギ, birds, dunlin, 野鳥, Kentish plover, plovers, shorebirds, waders, 水辺の鳥 by T Ibara Photo. Bookmark the permalink. I’m not sure if I’ve wished you a Happy 2019 I’m a little bit late! 💜 Blessings on your New Year 💜 Yay! Oh Takami, this little plover is so sweet. Clever birds, they always watch the shore for their flock safety. Hello dear Inese ❤ A very Happy New Year to you too! Amy, I understand about the watermarks. No one deserves to have their images stolen! While it’s a sad fact that images can/do get stolen, the mentality of “oh if it’s on the internet then it’s for free” is one that has always bothered me. It makes it even more challenging for creative people and artists too. Here’s to a good 2019! I’m too familiar with that mentality, Takami. Those of us who work hard to bring photographs to our viewers, must protect our art. I’m taking as many safely precautions as I can! Yes! Here is to a great 2019!! あけましておめでとう. I wish that the start of new year was good for You. We had a winter storm yesterday here. Many households are yet today without electricity on countryside. Sigh, because the temperature this morning in Helsinki is – 9 Celsius. I wish all the good for this year to You and yours. Thank you for your New Year’s greetings! It is a very cold and extreme new year in Helsinki. -9 Celsius is very cold, especially without electricity 😦 I hope that you and your family stay wam, and that electricity will be fixed soon. As always, thank you for your kind comments. I am happy if you enjoy my photos. He is on duty even over the holidays 🙂 Happy New Year, dear Takami! I love these birds. What a nice image! I love the bird looking at you. Seems to be the guard bird. 🙂 Perfect picture. I hope your 2019 is off to a great start. Yes, it is same in Japan too. These shore birds visit us in winter. It’s a joy to watch them. Certainly a vigilant and determined protector, Takami! He was very adamant about it indeed! Hello Sylvie, Happy New Year! This bird is watching you !